Through invention, design and continued innovation, Sprung structures excel when it comes to performance, durability, strength, and sustainability. Our substructures are made of aluminum—known for its high strength-to-weight ratio, superior malleability and excellent corrosion resistance. If you want to add insulation, you’ll also get a high-strength, rip-stop interior membrane that provides a complete finished interior. There is no need to add additional drywall or buildout. Our sophisticated tension system is built using individual 15 ft. (4.5-meter) membrane panels that are tensioned both vertically and horizontally. Combined with each Sprung structure’s unique shape, the robust tension system is built to endure extreme conditions—be it a frozen ice field or an active war zone. 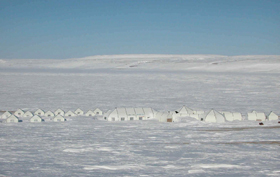 Extreme Cold: Arctic Watch, the world’s most northerly lodge, is located 80 miles south of the Magnetic North Pole. Extreme Winds: The Missile Defense System integrated architecture at Fluor Alaska Inc., located in Shemya, Alaska, is engineered to withstand wind loads of 120 mph. 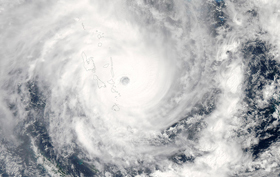 Warwick Le Lagon Resort & Spa in Vanuatu was used as a storm shelter on March 13, 2015 during Cyclone Pam, a category 5 cyclone. Extreme Snowfalls: The Kirkwood Mountain Resort in Lake Tahoe, California, has set a world record for snowfall in a single week at 9.7 feet in February 2011. Extreme Heat: Former U.S. Secretary of Defense Donald Rumsfeld addressed troops in front of a Sprung structure in the Kuwait desert. The fibreglass insulation system in Sprung fabric structures outperforms other types of construction, resulting in less environmental impact and lower operating costs. Additionally, there is virtually no air leakage, thanks to our unique design and performance insulation. Our care for the environment extends beyond our products to include the way we operate our business. We use recycled content wherever possible, engage in responsible construction waste management practices, and our structures are renowned for their exceptional energy performance, durability and end-of-life deconstructability. If you want to obtain LEED® certification, ask us how our well-documented environmentally sound products and building strategies can support your efforts.